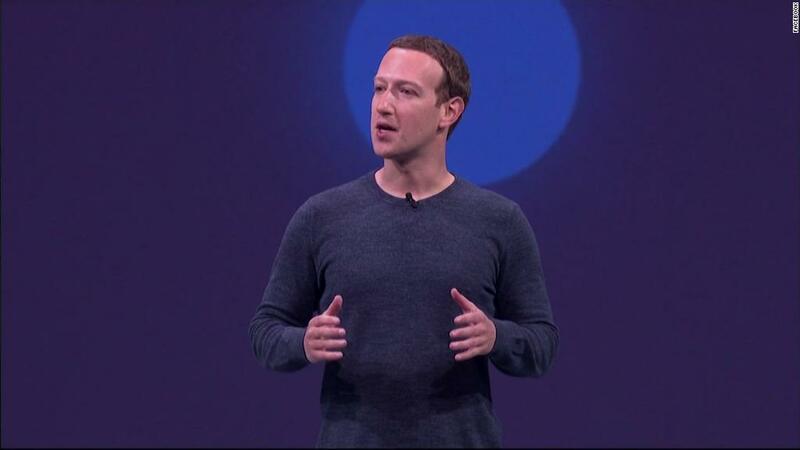 Mark Zuckerberg took the stage to deliver a keynote at F8, Facebook's annual developer's conference, on Tuesday. 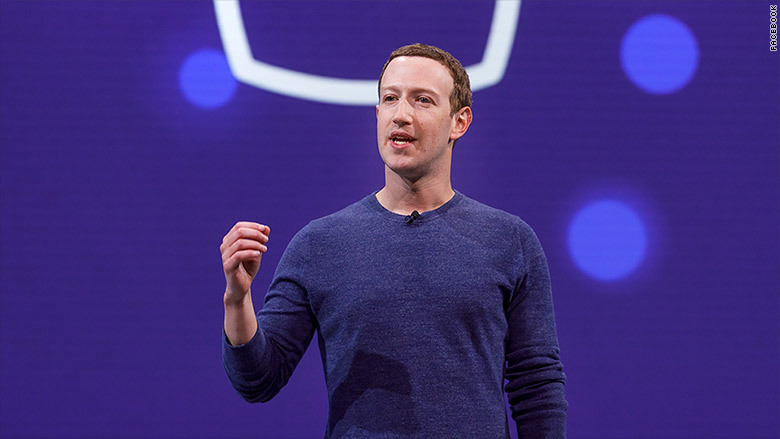 The CEO addressed Facebook (FB)'s ongoing data privacy scandal, election meddling issues, and fake news problems, recapping the company's efforts to fix those problems. But he also tried to move the narrative forward with new product and feature announcements. "We are all here because we are optimistic about the future," said Zuckerberg. "We have real challenges to address but we have to keep that sense of optimism too. What I learned this year is we have to take a broader view of our responsibility." And Facebook is adding new features for dating, Zuckerberg announced. There are 200 million people who have marked themselves as single on Facebook, he said. "This is going to be for building real long term relationships, not just hookups, it's going to be in the Facebook app but it's totally optional. It's opt in... we have designed this with privacy and safety in mind from the beginning... you will only be suggested people who are not your friends." The tool will let people build separate profiles just for dating using their first names only. Their regular friends won't see these profiles. People using the feature will be able to pick what groups or events they want to "unlock" to see more potential matches with the same interests. There's also a separate inbox for dating messages that doesn't allow photos, Facebook Chief Product Officer Chris Cox said in his own presentation. Shortly before Zuckerberg's keynote began, the company announced a new privacy feature that will, once launched, allow users to clear their browsing history on Facebook, including what they've clicked on and which websites they've visited. Instagram is getting a few updates as well. The photo-sharing app is adding group video chats to its messaging tool. The video can be minimized so that users can chat while still liking photos and swiping through their feed. Other new features coming to Instagram include augmented reality overlays from developers, like funny mustaches and hats, and new ways for third-party apps to have videos post directly to stories on Instagram and Facebook. A new instagram tool will filter comments and hide ones it detects as bullying. The filter is turned on automatically and rolling out around the world. It looks for attacks on a person's looks or well-being, and reports repeat offenders. WhatsApp may have lost its CEO, but it's gaining stickers and group video calls. What'sApp CEO Jan Koum announced Monday he was leaving WhatsApp and Facebook's board. Koum clashed with Facebook over its approach to encryption and personal data, according to a Washington Post report. "I just want to take a moment to thank Jan ... he has been a tireless advocate for privacy and encryption," Zuckerberg at the start of his keynote. "One of the things I'm most proud of is we've built the largest fully encrypted network in the world, and this would not have happened without Jan."
Facebook later brought out Mubarik Imam, director at WhatsApp, to emphasize the messaging tool's various privacy features, like end-to-end encryption. She also previewed the new group calling feature and stickers. Facebook's other messaging tool is also getting a couple new features. The Messenger app's layout has been redesigned, so that it looks cleaner. It is adding a limited translation feature that can translate English to Spanish and back for people chatting over Facebook Marketplace in the US. Messenger is going to expand that feature gradually, Facebook said, with suggestions for more translations in the future. Companies that use Messenger to talk to customers can now add augmented reality effects to their chats. An early example is Sephora, which has new makeup AR overlays so that users can, say, try on blue eye shadow without leaving the house. After the Cambridge Analytica news broke, Facebook froze all new app approvals while it reviewed its system, audited existing apps, and dealt with a public relations crisis. Zuckerberg announced Tuesday that app reviews were open again. "I know it hasn't been easy being a developer these past couple of months," said Zuckerberg. Ime Archibong, Facebook's head of platform, said the process will be slightly stricter going forward. More companies will have to be verified by Facebook before they can roll out an app. "Our goal here isn't to be difficult," said Archibong. "I know this is going to be harder work on both ends for us." Facebook's only hardware announcement on Tuesday was about a virtual reality headset. The Oculus Go, a $199 stand-alone headset, is now available for sale. Zuckerberg said everyone in the audience would receive a free Oculus Go. The company needs developers to create content for the device, so giving out the hardware is a strategic move. Related: Can the $200 Oculus Go make virtual reality mainstream? There are also a handful of new experiences in Facebook's version of virtual reality. People will be able to attend events like concerts with Oculus Venues, play games with friends in virtual Oculus Rooms, and watch a giant TV in virtual reality using Oculus TV. The new features are rolling out this month. The company is also continuing to expand its augmented reality offerings, like 3D photos. The images will be available in the main Facebook app in the summer. Zuckerberg was cheerful and even giggly at times during his presentation, a far cry from his stiff testimony two weeks ago in front of Congress. He had a much more receptive audience at F8, with developers cheering like he was a rock star and even yelling things like "thank you!" at the stage. Zuckerberg called out "Watch Party," a tool announced in January that lets you watch shows while chatting about them with your Facebook friends. "Let's say that your friend is testifying in Congress, for example. Now you're going to be able to bring your friends together and you can laugh together and you can cry together. Some of my friends actually did this! Let's not do that again anytime soon," Zuckerberg said. The event comes more than a month after news broke that Cambridge Analytica, a data firm with ties to President Donald Trump's campaign, accessed information from as many as 87 million Facebook users without their knowledge.